“It is in our grasp. 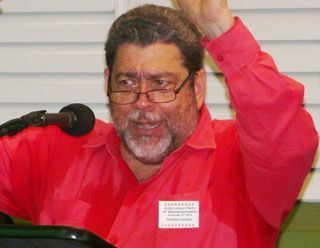 Only we can conspire to deny ourselves this extraordinary achievement,â Prime Minister Dr Ralph Gonsalves, who is also political leader of the ULP, told its 19th convention on Sunday at the West St George Secondary School. He further said that Labour parties have governed the country for 24 of the 43 years since it attained statehood in 1969. In 2010, the ULP was elected to a third consecutive term â historic for a Labour party here. And Gonsalves said when the current term is complete in 2015, Labour will have been in government 27 years and would be confirmed as the natural party of government in St Vincent and the Grenadines. But what was most important, he further explained, was that everybody learns the important lessons from the victories and defeats. “Central to victory is to keep close to the people and act in their interest,â the prime minister said. Last Sundayâs convention was held under the theme “Consolidating the Renewal of Party and Governmentâ. And Gonsalves said he was going to use his presentation as the basis over the next year for the consolidation of the process and facts of the renewal in the party and government. “The strides this country have made have been made possible through the vision, the philosophy, the economic strategy, policy, programmes, leadership and membership of Labour in concert with the rest of the people,â he said. And while there are still some challenges, Gonsalves said he believes that the country is far better off because of the various Labour eras, beginning with the founder of the party, Robert Milton Cato in 1969. “These things are in our history, our DNA; but sometimes we forget,â he said. He said people forget because they were occupied with their livelihoods. But even this needed to be grounded in something. “And the something on which it is grounded is the legacy of Labour. “We are nationalists, regionalists and internationalists,â he said. Labour has done the lifting for the people of the country, but for a brief period the people lost favour with the political party, he said. He, however, noted that the Labour party has won the popular vote the majority of the times since the two-party system came into existence. But it was necessary to organize properly, provide good candidates, run good leadership, promote and implement practical and sensible policies, he said. Gonsalves said it was time for those slacking to tighten up, but not just those from within the leadership, but those in the rank and file as well. The ULP came to office in 2001 and since the re-election in 2005, the party has been engaging in the process of renewal internally, he said. This journey involves personnel, policy and programmes, the prime minister continued. “We have a party where we have a family; but even in this family we donât talk about family without following Christ.â He encouraged supporters to be active and remain lively. “Our country is on the right path and despite the challenges and setbacks we are progressing,â he said. “Over the next year I intend to symbolize, personalize and undergird the consolidation,â Gonsalves continued. He ended by saying that he had received an endorsement from the partyâs central executive for him to lead the party into the next general elections â constitutionally due in 2015.